The Fennel patch is popular with several species of Ladybird. Here is a non-spot Ladybird investigating a flower-head, and inadvertently providing pollenation services as she goes. The colors go well together. Ray: I think so too, Larry. Excellent shots of more Fennel lovers! Ray: There are many Fennel lovers in the patch, Elizabeth. The fennel is the favorite place for many 'flying objects'. I love this series very much, Ray. Ray: More of the series next week, Astrid...I have many images to choose from. A ladybug without spots! I declare. I especially like the second image, Ray! Ray: I liked that image too, Ginnie. Jolies rencontres de toutes ces insectes , le fenouil est une plante qui plait beaucoup ..
Ray: Le fenouil semble attirer beaucoup de créatures différentes, Claudine ... y compris les humains. Ray: Ladybirds are really active on the Fennel, Lisl...more on that subject next week. Good for her! I've never spotted a non-spot ladybird before. The fennel seems to be favoured by all sorts of visitors. Ray: I'll continue the series next week, Alan, as I have many images to choose from. Oh, the ladybird has found her destination and is now indulding in the fennel. 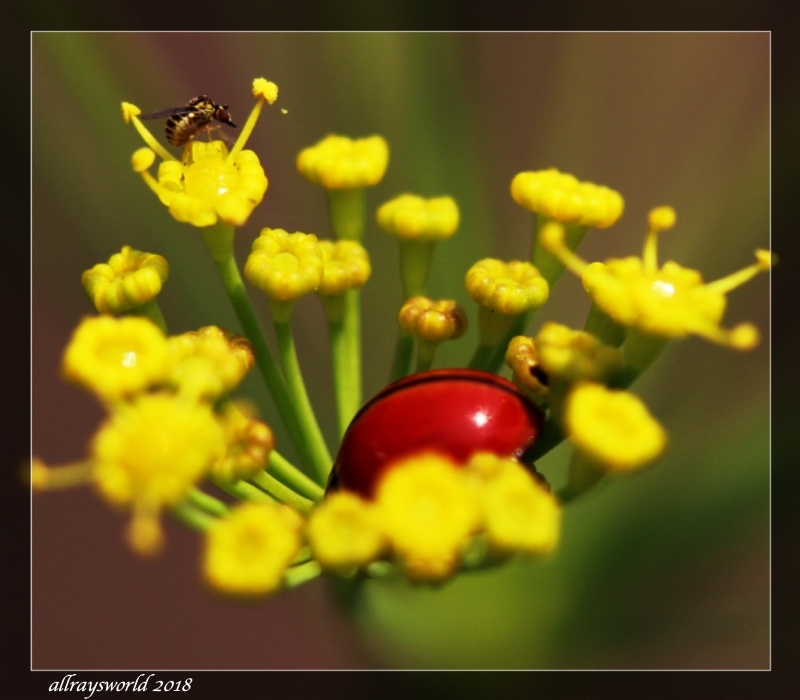 Ray: I found at least 3 species of Ladybird in the Fennel patch, Philine. Ray: There are many species of Ladybird in Thailand, Chris, and I have seen at least 3 on this Fennel patch. I am fed up with ladybirds spending the winter in my window frames and the doors of my le camping car. There, I feel better now. Ray: Deep breath...glass of something soothing [Talisker should work]...all good now! Great going, especially the bottom shot, where the ladybug is a bit shy. Ray: Plenty of activity to observe on the Fennel patch, Louis. I like that bottom photo with the big red beetle really taking a starring role. Ray: It is an attention grabber, Mary! I've not seen a spotless Ladybird before. Two insects for the price of one in the lower shot. Ray: I caught multiple species in many of these shots, Brian.